In the course of their endless, mostly futile efforts to dampen ostentatious consumption by the merchant class, the Edo Shogunate placed sumptuary law restrictions on various aspects of woodblock printmaking, including setting the maximum size for an individual ukiyo-e sheet. Thus arose the common 25 x 38 cm format, the standard ôban. Clearly, such meager dimensions could not do justice to a print designer seeking to depict the whole expanse of a crowded kabuki stage, or a wide, riverside verandah full of geisha. Clever publishers therefore devised the expedient of spreading such compositions over two, three or more sheets, which the buyer could then arrange side by side to form a continuous image of more substantial dimensions. Apparently, as long as each sheet was separately signed and approved by the censor, the letter of the law was upheld, and no punishment meted out — the result being that diptychs, triptychs, and still larger arrays of sheets became the publishing norm in 19th century Edo and Osaka. Most polyptychs consisted of ôban lined up side by side, but occasionally a design would call for one sheet to be placed directly above another. This facilitated easy conversion of a standing beauty into a hanging scroll, and also came in handy for rendering any vertically-oriented kabuki scene: taunts being hurled from a balcony, roof-top fighting, waterfall action — that sort of thing. Then, too, every so often, multi-sheet prints were designed to extend along both axes. This created unorthodox dogleg and inverted "T" compositions. But, why not? There were certainly no framing issues to fret about. For 19th century Japanese, the amount of available tatami space for laying the sheets out was the only consideration. (That, and the ingenuity of one's album maker … see Gajô article). The piece illustrated here, datable to the first month of 1814, is a kabuki scene signed Ashimaro, an early name for the important Osaka artist, Jukôdô Yoshikuni (fl. 1813-30). It shows yet one more way to work within the limits of the ôban format and play with novel, multi-sheet configurations. 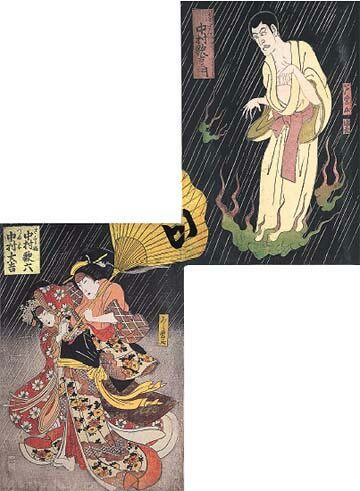 The challenge for the designer was to have the pale ghost figure on the right (ex-priest Seigen, sepulchrally played by perennial superstar Nakamura Utaemon III) hover above and in front of Princess Sakurahime, the object — even after death — of his unrequited love. Ashimaro's creative solution — a diptych skewed on a steep diagonal — also served to accentuate the already substantial unsettling eeriness of the scene. (Pitch-blackness and rain were classic Osaka trademarks, flames and no feet sure signs of being in the presence of a spirit). The effect is memorable, and one wonders why such a slanted, off-balance approach was not used more often. The problem with publishers having to string together ôban in series to achieve scale is that, over time, individual pieces often get separated from their companions. This happens from carelessness on the part of collectors (a print gets damaged or misplaced) or personal taste (one actor in a triptych, say, falls out of favor). Or, it can result from the venality of dealers — single sheets are easier to sell than multies — and, even today, from haste and ignorance. Sheets being orphaned from ignorance is likeliest in tricky configurations, where the link between two sheets — especially if removed from each other by a few inches in a proverbial "stack of prints" — may not be readily obvious. Early on in polyptych evolution, designers carried elements over from one sheet to the next, as Ashimaro did here with the umbrella. Later, however, as if intuiting that the public would lose individual sheets, (or even buy incomplete pieces), publishers favored the strategy of each sheet being compositionally self-contained. Also particularly prone to the separation syndrome are Osaka prints. Historically, Osaka works were lightly regarded, and even now are poorly understood. Very few dealers realize, for example, that Osaka polyptych compositions routinely feature different signatures on each sheet, and that tetraptychs (unheard of in Edo because "4" is traditionally an unlucky number) were commonplace. Accordingly, the heritage of Kamigata publishing has been routinely broken up and today finds itself scattered higgledy-piggledy over several continents. Alas, a discouraging portion of many Osaka print collections consists of incomplete polyptychs, the owners of which struggle to find the missing ôban bits. For such collectors, the Internet holds no greater promise than its potential, perhaps through a displaced ôban match-up site, to identify the whereabouts of lost pieces and, following a swap meet of presumably giddy proportions, restore numerous works to their original, full-size glory. This article originally appeared in Daruma, no. 37, Winter 2003. Copyrighted © text and pictures reprinted with permission.